Chunk has been a lucky boy again this week and been given the chance to test out the new Toy Post Office by Casdon. 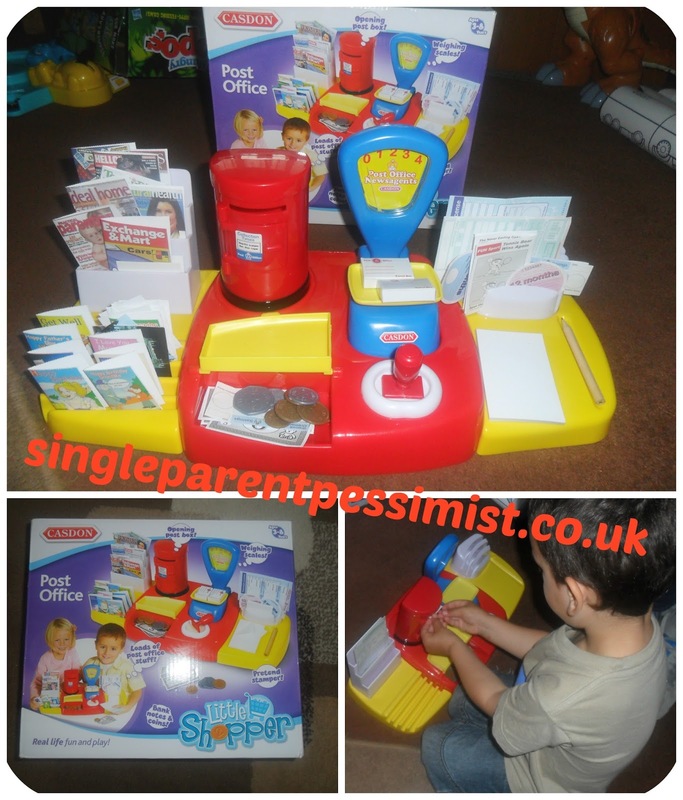 It was nice and easy to put together and has so many little features that are so lifelike, including cards, envelopes, newspapers, stamps, money and even a letterbox! Chunk spent ages folding the cards and putting them into envelopes so he could post them, and then he enjoyed taking them out and delivering them like a postman! He also liked me using the coins to buy papers and to have parcels weighed and stamps put on them. I had a post office toy similar to this when I was a child and I remember spending hours playing with it and my sister being one of my main customers. My dad even made lots of different shaped parcels that I could weigh and stamp, so this has inspired me to add to his little post office soon. I like these types of toys because role play really helps his imagination and it's something he can engage in for quite a while as it doesn't get boring. We can also do things such as counting the coins, looking at the shapes of parcels and choosing different coloured stamps which all aid his learning, so I recommend this toy for your preschoolers! Chunk was provided with this toy post office to test for this review. No payment was received and all opinions are honest and my own.